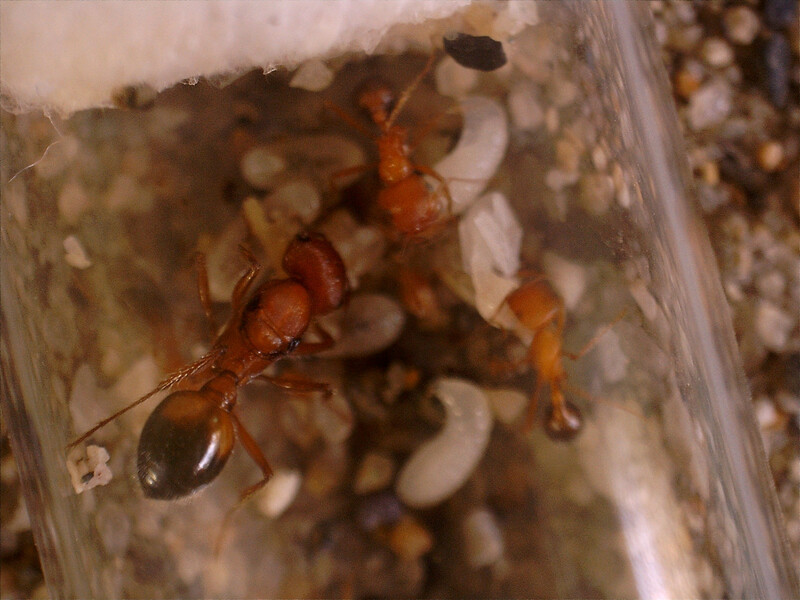 California Red Harvester Ant. I purchased this queen from Mike Busto/GAN and picked her up From Andrew on 12/18/14. I suspect she was one of the queens described in this journal. She came with about 6 nanitics and about 3 larva. She stayed with me in my hotel room over night and we drove home the following morning. I was worried about the drive home as it's usually a pretty rough drive (Anaheim to San Jose, CA) but they seemed to do just fine. On 12/20 I purchased a "cube" nest from Ants National to get them started, but I'm hoping to get them into something else when they are large enough. I'm worried about transferring them from their test tube to the cube because it doesn't look like it comes with a connection port to hook the test tube up to, and I don't feel comfortable trying to move them myself. I may have to buy another nest if there is no way to connect the cube to my test tube. I'll see when it gets here. They're moving around super slow this morning so I'm wondering if it got too cold in here for them last night. The low this week is 45 degrees, and last night was around 50, so I don't think it is too cold for them, but I really don't know. Since I've been writing this it has warmed up and they're moving around more, so I guess that's normal. I hope she continues laying eggs. I want her to live for a long time and produce many babies. Edited by BugFinder, December 21 2014 - 9:09 PM. Good luck with your Pogonomyrmex. Is this your first colony? I think I already saw this on FB... Nice colony. 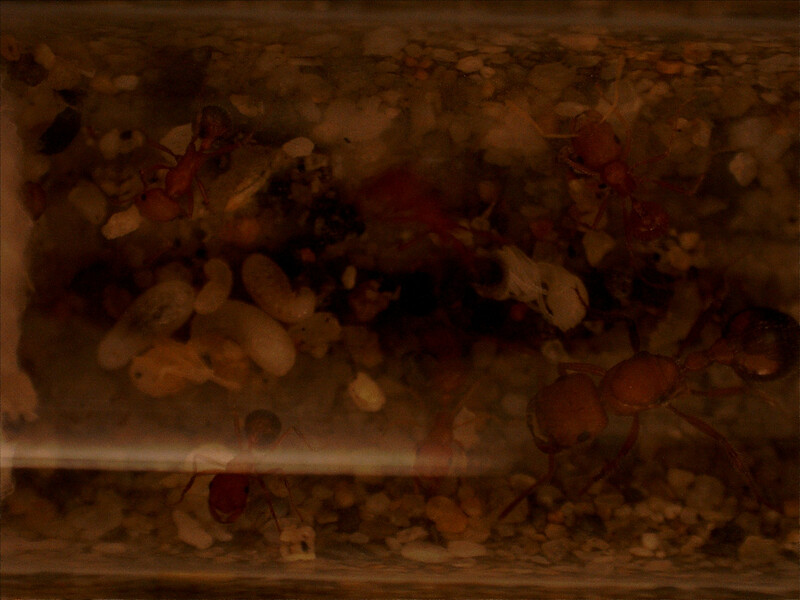 These Pogonomyrmex absolutely love byFormica Blue 100- just in case if you cannot get them to take other things. I would leave them in there for now. That setup should be good for up to 50 ants at least. Grats on the colony. Ants will drive you nuts, test your patience, and make you rethink about your sanity. Why do you recommend the Nucleus? Why would you recommend leaving them where they are instead of using the cube? I appreciate the suggestions, but the why is just as important to me as the what. Best Regards. I just re-counted and it looks like I have 7 larva. Edited by BugFinder, December 21 2014 - 3:11 PM. Relocating a colony is a stressful job for both you and the ants. It's common to see some workers and larvae die even from seemingly successful relocation. I think it's the best to leave them as they are until they grow in size and can afford some deaths. I am recommending Nucleus because it has a removable side window that lets you access the nest directly. Edited by dean_k, December 21 2014 - 3:15 PM. Thanks Dean. I really appreciate your advice, and your time. Happpy holidays! It looks like two of what I was calling Larva are actually pupa. I've learned alot about ants this week, lol. So by my last count I believe I have 5 larvae and 2 pupa, and I still don't see any eggs. Here's another picture, just because I like sharing them, lol. Edited by BugFinder, December 21 2014 - 7:31 PM. I just saw the queen sitting in a funky position with her gaster curled underneath her (photo below). Is this abnormal? Is she laying an egg or pooping or something? She could be cleaning herself. Or laying an egg. Do you see any eggs in any of my photos? All ants do it, not just queens. They are cleaning themselves. Don't be tempted to move them into a larger nest before they grow. I made that mistake and excitedly moved them into a Nucleus. After a few workers died, the rest didn't know to forage and huddled in the bottom chamber. Thankfully I was able to relocate them to a Talus where they've had no problems. So we left town for Xmas, and left the ants at home. Knowing how cold my home gets when we turn the heater off, I left the ants on top of the refrigerator hoping they'll get some warmth. Since we were going to be gone for a few days, I left them some extra food. When I got home it appeared they had gotten quite cold. At least one worker was dead, and they had buried quite a bit of the food I put in there for them. I removed the food today and left the cover off the top of the box they are in hoping to dry it out a bit. Today's count looks like 6 larvae, two pupae, 7 workers, no eggs that I can see. What happened to lighting? I can hardly see. Anyway, it hurts A LOT to lose workers when your colony is small, so I feel for you. The lighting in my home is kinda difficult to manage. It's either so bright it creates a glare on the test tube, or it's too dark. I try hard to reach that middle ground, but today it didn't work well. Sorry for the poor lighting. I just started reading this today. Unless you had other business, why did you drive all the way to LA? You can just wait till spring/summer and catch your own. don't mean to kill your buisness by the way Andrew. Edited by LAnt, December 28 2014 - 9:53 PM. I just started reading this today. Unless you had other business, why did you drive all the way to LA? You can just wait till spring/summer and catch your own. Thanks for your question. 2 reasons: I am in the LA area twice a month anyway, so I didn't drive all the way down there just for this, but I would have because I didn't want to wait until the flights, and then maybe not catch one. I wanted to start right away, and when they fly again, I'll be out there trying to catch some and if I get none, that's ok because Andrew will and I'll buy another queen from him through the GAN! !